In the post-genomic era, understanding inflammation and its intricate mechanisms is the final frontier. While ancient physicians recognized inflammation’s cardinal signs as heat, redness, swelling and pain centuries ago,the cellular and molecular players in this vital inflammatory host response have only been elucidated for the most part in the last century. Today, it’s now well appreciated that uncontrolled inflammation and excessivetissue levels of inflammatory mediators play central roles in the pathogenesis of many widely occurring diseases throughout the body and all its organs. At one time, the study of inflammation and inflammatory diseases was confined to chronic inflammatory diseases such as rheumatoid arthritis, periodontal disease and the like, while today it is commonly appreciated that neurodegenerative diseases, cognitive decline, vascular diseases, asthma, obesity and many other widely occurring diseases involve uncontrolled, recurrent bouts of inflammation. In order for us to gain and harness new approaches to treat these diseases and appreciate the complexity of the inflammatory response, it is essential for students, scientists and health care practitioners to command a detailed appreciation of the cellular and molecular language of the inflammatory response, the mediators and governance of this body defense system. The acute inflammatory response is protective, many of the cell types, mediators and mechanisms are known today, and the control of self-limited responses and the progression to natural resolution and tissue homeostasis are beginning to be unraveled. As a major defense mechanism, the innate immune response protects from bacterial invasion and is centered on containment and killing of microbes for their elimination from the body. Hence, the interrelationship between infection and inflammation is a battleground with language that needs to be fully decoded and appreciated in order for us to gain advantage in treatment of diseases where inflammation plays a critical component and hopefully translate into protective practices in personalized medicine. Inflammation and the controlled inflammatory response, namely its resolution, is thus linked to many of life’s processes such as wound healing and aging, while an uncontrolled inflammatory response is viewed today as the instigating mechanism underlying diabetes, neurodegenerative diseases and neuroinflammation and likely many diseases, both sterile injury from within and yet-to-be-described invaders, emphasizing the importance of the inflammatory response and ongoinginflammation as maybe relevant in obesity, metabolic syndrome and aging. The microbiome’s relationship to containment, infection and local tissue inflammation in organs throughout the body remains to be fully decoded, and it is well recognized that the stress of surgery and the local scalpel cut of the surgeon initiate inflammatory responses and potentially (via occlusion of blood vessels with blood reflow)injury from within. It is within the spirit of widely appreciating these cellular events, processes and mechanisms that the editors, Drs. Diegelmann and Chalfant, have assembled this eBook containing major contributions from an international distinguished panel of experts to present a didactic experience of the basic cell biology as well as clinical aspects of inflammation. 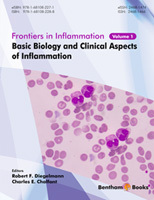 The chapters are by authorities and leading investigators and systematically introduce the cellular and molecular initiators and defenders in the acute inflammatory response and go on to include chapters on inflammation in metabolism, aging, allergy, diabetes, cardiovascular, arthritis, oral disease, gastrointestinal and neural inflammation in well-illustrated and clearly presented didactic chapters. Inflammation when presented in medical school is usually a component of general pathology, or immunology, and in some cases microbiology as well as each of the medical specialties in small bites. Thus, in many respects, the presentation of the innate immune response and its communication to acquired immunity is fragmented in the traditional medical curriculum. This ebook helps to provide, in one succinct presentation, a cohesive view of our multidisciplinary appreciation of inflammation today and how it impacts many disease processes and organs throughout the body. The editors have also taken care to present current approaches in pharmacotherapy in inflammatory responses as well as the application of mathematical modeling and network analysis to inflammation. These are valuable and can help provide a strong foundation to the readers for appreciating the role of inflammation and its treatment for both personalized and precision medicine. This eBook on Basic Biology and Clinical Aspects of Inflammation should be of wide interest across disciplines to not only practitioners, health care providers and basic medical scientists, but should also be of interest to the pharmaceutical and cosmetic industries as well as nutrition and economists, because of the tremendous economic burden of diseases where uncontrolled inflammation is a key culprit. Drs. Diegelmann and Chalfant give us a well-integrated eBook and chapters that will enable the reader to increase our present understanding and gain insight to discover new means to marvel and control this important life process.Inflammation is all! In recent years there have been many exciting advances made in the field of inflammation. State of the art scientific technologies have helped make these advances possible. As underlying cellular and biochemical mechanisms responsible for the inflammatory response are better understood, new therapeutic strategies can be developed to treat the spectrum of clinical problems associated with excessive inflammation. This educational eBook, “Basic Biology and Clinical Aspects of Inflammation” was developed for a wide audience. Basic scientists, academicians, clinicians, health care regulators, industrial and pharmaceutical scientists as well as the lay public can benefit from the expanse of knowledge presented herein. To help continue promoting cutting edge scientific research and technology, the Editors and all contributing Authors have agreed to donate their royalties from this eBook to the Wound Healing Foundation (http://www.woundhealingfoundation.org) for young investigator research grants. In addition, we recognize and appreciate Bentham Science Publishers for their generous support and contributions to the Wound Healing Foundation. We dedicate this book to our wonderful wives, Penny and Laura and our loving children, Sarah, Laura, Ryan, Stephen, Scott, Isabella, and Alec.